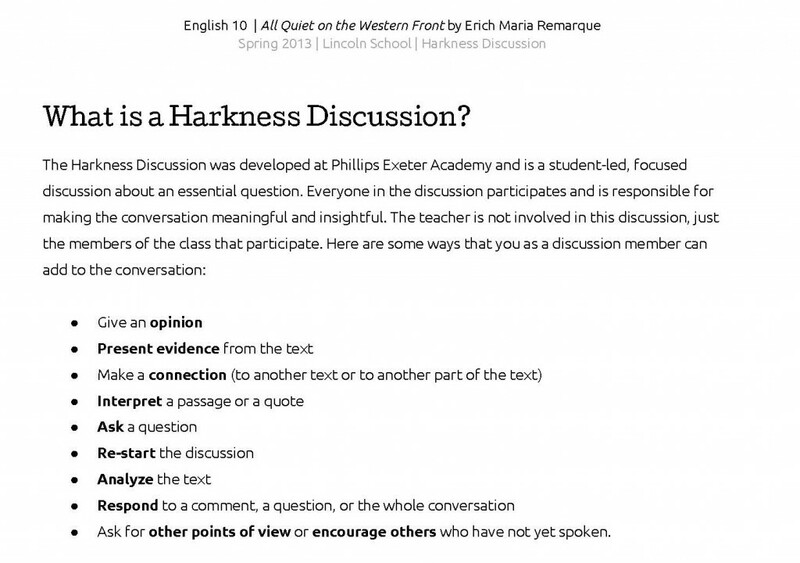 What is a Harkness Discussion? Ask for other points of view or encourage others who have not yet spoken. This is a team effort and everyone in the group discussion will contribute to the group grade. It’s okay for it to be silent for a little while, for people to reflect and start another train of thought. Also, be respectful of each other’s voices and presence in the discussion. You want everyone in the group to have the space to speak and to listen. Preparing for the Discussion: Use your annotations, notes, and knowledge of the book to help you. You will need to bring one page of notes (typed, single or 1.5 spaced) to the discussion. Load up your page with quotes from the text that you feel are important to the answering of the essential question. Put page numbers next to events and details you mention! And also write down your own questions and possible answers to those questions to be used in the discussion. How do the forces of the majority influence the individual? What does it mean to be human in times of extreme conflict and change? How does the Allegory of the Cave relate to Paul’s experience in AQWF? What does Paul mean when he says, “Words, words, words—they do not reach me” (pg. 173)? You may bring up other questions in the discussion, but start off with these two and see where the conversation goes! The better prepared you are the smoother the discussion can go. But have fun with this. It’s a great time to really talk about what you find interesting and important about the themes of the book. This article was written on 18 Feb 2013, and is filled under Homework Assignments, In Class.